Hyderabad Metro along with other Metros is missing ways and means of garnering eye balls. Unlike other metros, Hyderabad Metro’s concourse is at a different level (level1) and the platform is on a different level (level 2). HMR says 70,000 to 80,000 people are utilizing their service every day. The retail outlets are not ready, the billboards in the platform are not totally let-out and I have never seen any product promotions take place during my travel. Two days ago, ‘The New Indian Express newspaper’ was being given free. But sadly no one was picking up a copy! The Reason, there was no notice saying ‘pick me up’ and there was no-one from ‘The New Indian Express’ to hand out the free copy. I did pick up a copy and most other passengers were throwing curious glances at me. Except for air travellers, none of the other passengers were used to picking up a free copy of stacked newspapers. They were under the impressions that the newspaper was not free and that they would be asked to pay. Good experiment but the entire effort was wasted due to wrong execution. Except for the super travel experience, Hyderabad Metro does not offer any chance or excuse to stay and linger. And marketing is all about stickiness. There is hardly any reason for anyone to stick around. If people stick around, the stations would appear crowded and that would create a buzz, action, popularity and of crowds. Because of unimaginative marketing, the metro stations look deserted and frankly are frighteningly lonely spaces for girls and women. There is hardly any vibrancy. 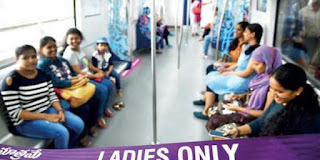 And to top it all Hyderabad Metro rail has introduced ladies only restricted seating area. It is a very retrograde move. 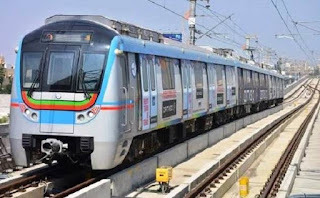 I have travelled in many metros including BART (Bay area Rapid Transport) in California bay area, Bangkok Metro, Delhi Metro, Bangalore Metro and in Chennai Metro. No other metro except Hyderabad has restricted ladies only seating. The ladies only seating area separators look shabby and tacky. I have observed many times that there is space in the ladies only seating area and many women sit in the unrestricted area while many men including senior citizens are left standing. Somehow it makes for a very depressing sight. So technically even if the reserved seating is free, men can’t enter that space. Definitely, have separate seating area for women but the divider mars the Hyderabad Metro claim of ‘Global form of high speed travel’. Similar experiment was tried out in Hyderabad city buses where literally a door was installed to divide the women’s seating from the men’s seating area. The idea was an utter flop and it was hastily withdrawn. So like a proverbial fool, Hyderabad Metro is rushing into something when one needs to tread with caution! It is not the case of once bitten twice shy! Keep making one mistake after another and hope that committing many mistakes will finally result in one correct result or an outcome. And to top it all there is talk to have ‘a women only station’. Excuse me ‘what do you mean women only station?’. And Pray! what should the men who want to get down or get into the metro from that particular station do? Are they supposed to go to the next station? If it was not so silly, it would have been a good joke. Nice article. Regarding ladies coach, I know that Delhi Metro has separate ladies coach. Generally the first coach is ladies coach. TSRTC runs few buses which are only for ladies. It is a token measure for Government to brag that safety of women is paramount! Nice one sir,very interesting to read about our HMR.